Date of issue: 20.10.14 Узнать о наличии версии 2015 года! The research contains 98 schedules, 60 diagrams, 120 tables and 1 figure. 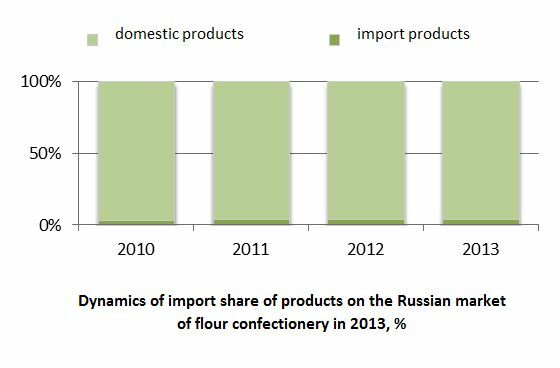 A two year crisis decrease (2008 - 2009) in the dynamics of Russian import of flour confectionery followed by growth of import deliveries started in 2010. Amout of products imported in 2011was by 25.7% larger than in the previous year; in 2012-2013 increase rates were at the level of 8-9%. Against a slowed down increase of production, active growth of import affected share of foreign products on Russian market. 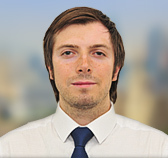 According to the experts of Intesco Research Group in 2013 import products reached **% of the market, that is by 1.3 p.p. exceeds values of 2010. Considering an increasing demand for non-traditional flour products among Russian population, foreign companies are able to enlarge their share in Russia. 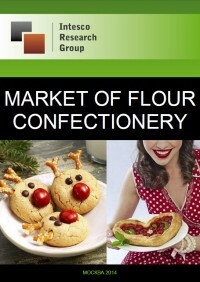 In 2007 – 2009 volume of flour confectionery imporedt to Russia was characterized by тупфешму dynamics. In two years deliveries reduced by 18.6% or ** ths. t. However from 2010 volumes started recovering, and already in 2011 they exceeded the values of 2007. It should be noted that the largest increase in volumes of import products (more than by one fourth) was recorded exactly in 2011. In 2013 ** ths. t of products were delivered to Russian market. It is by 8.1% more than the value of 2012. 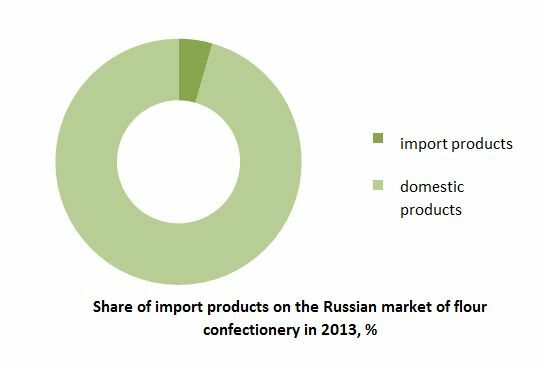 The larhest share in the structure of Russian import of flour confectionery in 2013 was constituted by dry sweet biscuits – 7**%. One fifth was made up by waffles and wafers (**. 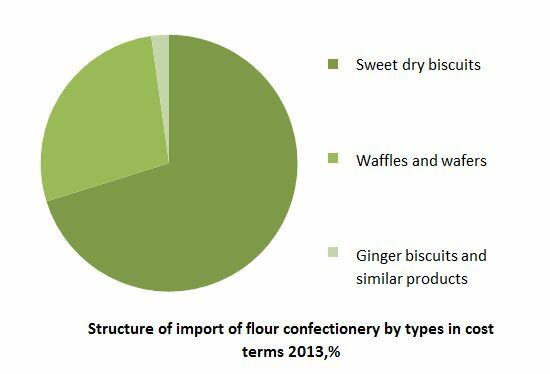 *%) and only 2% belonged to ginger bicuits and similar products. During 2008-2013 growth of sale prices for waffles has been observing. In 2013 the price grew almost 2 times in comparison to 2008 and amounted to **.7 ths. rub/t. 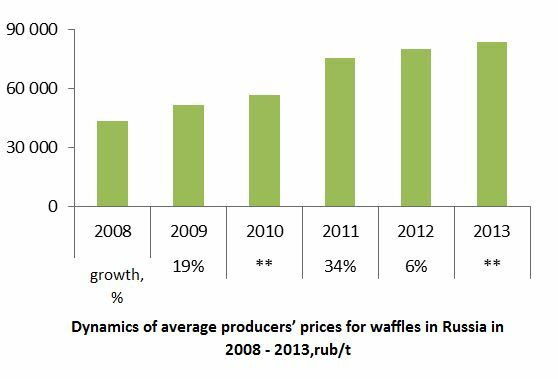 At that it should be noted that during last two years increase rate of prices for waffles was lower than the official inflation rate (*% in 2013). Throughout the period analyzed average producers’ prices for biscuits demonstrated a steady growth. The largest increase in prices was recorded in 2009 and 2011 – +**% each year. In 2013 an analogous value amounted to **%. 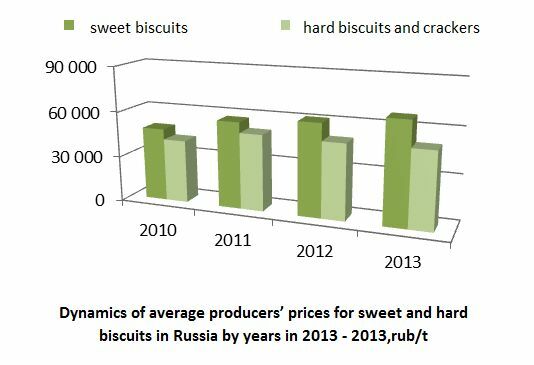 Therefore in 2013 producers’ sale prices for biscuits in Russia increased almost two times in comparison to 2008 and reached **.5 ths. rub/t. In 2010 due to amendments to All-Russian Classification of Products producers’ prices for biscuits have been considered including two more items: sweet biscuits and dry biscuits (hard biscuits and crackers). Average price for sweet biscuits amounted to *7.4 ths. rub/t in 2013. This value exceeds price for hard biscuits and crackers by 16.9 ths. rub/t, which were sold at a price of *0,4 ths. rub/t. Schedule 19. Consumption of flour confectionery per capita in Russia in 2010-2013, kg per capita. Schedule 20. Dynamics of retail sales of confectionery in Russia in 2009-2013, bln. rub. Schedule 21. Dynamics of retail sales of confectionery in Russia by quarters in 2009-2013, bln. rub. Table 6. Volumes of retail sales of confectionery by quarters in 2009-March 2013, bln. rub..
Table 8. Volumes of retail sales of confectionery by regions of RF in 2009-2013, ths. rub. Schedule 47. The largest enterprises with the main type of activity by Russian National Classifier of Economic Activity “Production of dry bread and bakery products and flour confectionery of long shelf life” by proceeds in 2012, mln. rub..
Table 43. Rating of the largest enterprises with the main type of activity by Russian National Classifier of Economic Activity “Production of dry bread and bakery products and flour confectionery of long shelf life” by proceeds in 2007-2012, mln. rub. Schedule 51. 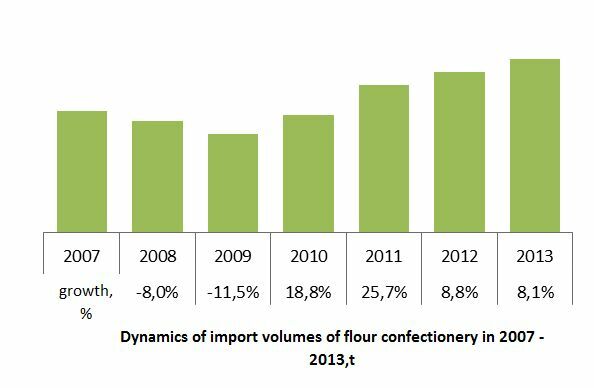 Dynamics of volumes of flour confectionery import by months in 2009-March 2014, ths. dollars. Table 46. Volumes of flour confectionery import by months in 2009-March 2014 , ths. dollars. Table 48. Volumes of flour confectionery import by supplying countries in 2007-2013, ths. dollars. Table 54. Volumes of Russian import of waffles and wafers by supplying countries in 2007-2013, ths. dollars. Schedule 57. Dynamics of import of sweet dry biscuits in 2007-2013, ths. dollars. Schedule 59. Dynamics of import of sweet dry biscuits by months in 2009-March 2014, ths. dollars. Table 56. Volumes of import of sweet dry biscuits by months in 2009-March 2014, ths. dollars. Table 62. Volumes of Russian import of ginger biscuits by supplying countries in 2007-2013, ths. dollars. Schedule 65. Dynamics of flour confectionery export in 2007-2013, ths. dollars. Table 64. Export volumes of flour confectionery by countries of destination in 2007-2013, ths. dollars. Table 70. Volumes of Russian export of waffles by countries of destination in 2007-2012, ths. dollars. Schedule 69. Dynamics of export of sweet dry biscuits in 2007-2013*, ths. dollars. Schedule 71. Dynamics of export of sweet dry biscuits by months in 2009- March 2014, ths. dollars. Schedule 73. Dynamics of export of ginger biscuits and similar products in 2007-2013, ths. dollars.